Although my birthday is over, there's just no way I can completely say goodbye to my special day without acknowledging some very important people who made the occasion even more joyful with their lovely birthday gestures, just for me! First, I'd like to say thanks for my very first award from my Big Bro, the sweet talker who speaks in his own language of synchronizationess - Mr. Zubli Zainordin! This award is extra special as he created it especially for me so I have exclusive rights to it! Zubli awarded me with the Mesra Marzie Marvellous Mariuca Award! Wow! A very unique award created just for me on my birthday - I LOVE IT! The butterfly is a lovely symbol of beauty and freedom, which is how I'd like to describe my friendship with Zubli. The beauty of our relationship lies in the fact that no matter how "free" or far apart we are from each other within the blogosphere, we'll always find a way and the time to say hello to one another. Zubli - with you, even the silence is special! Zubli also presented an award to my lovable Phoebe! As Phoebe's Number 1 Fan, Zubli felt it was only right for Phoebe to receive an award on her Master's special day, so he presented her with the Ikano-Phoebe Best Friends Forever Award, which no other pet will receive! Thank you Uncle Zubli, Phoebe feels special too now! 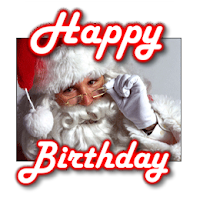 I'd also like to give a special mention to Mr. Claus himself, who made me feel oh so magical when he dedicated a Santa Birthday Wish for me! HUGS for you Santa! Next, I'd like to thank Jean Chia for her very sweet birthday dedication to me. It's been such an honour knowing this lovely lady, who has been my good friend since day one, and now one of my best! Love ya Jean! Thanks to the wonderfully romantic Joezul, for this lovely birthday poem! I ask you, who wouldn't swoon and feel special if given such a sweet poem like this? Thank you very much Joe! Thanks to my new friend Karen, who gave me a beautiful white birthday cake, which made me feel 20 years old again! How very thoughtful! I was dreading turning another year older but her sweet gesture made me smile throughout the day! Thanks to Jamilla, the chirpy, fun-loving gal, who made my birthday celebration even merrier by getting people to comment on my birthday post in the hopes of getting my number of comments up really high! She did an excellent job by the way. Thank you for the lovely Birthday Coffee! I love it!! I also have to say thank you to Miss Creative herself - Emila, who made her very first attempt at writing a cute Birthday Poem for me. Thanks dear, that was really such a sweet gesture, one that I truly appreciate! 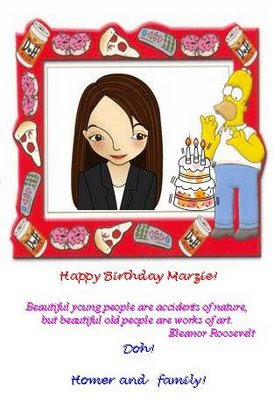 Next, I have to say thank you to Adrian - my wonderful buddy, who despite being sick after his Bangkok trip, still managed to put up this adorable Homer Birthday Card for me on his blog! Thanks for everything Adrian, you're the best! Also, thanks to my favourite Virgo Buddy - Barrett, for his mini mention of my birthday, together with the Birthday Meme that he put up after I tagged him with it. And not forgetting one of my best friends, the rockin' NAFA TEAM, who featured me on their blog on my special day! Thanks for staying up with me, Janice & Jean, celebrating till midnight! I had a blast! Last but not least, I'd like to say thanks to Bobby, who unfortunately was unable to put up his birthday post for me on his site, due to the massive site problems he was enduring during my birthday week. Although he told me of his intent months ago, he was unable to carry out his plan. It's okay Bobby, it's the thought that counts! Thank you to everyone once again for making this birthday one of the best ever for Mariuca! See you guys again next year! yay!! im the first commenter!!! i love it when im the first one here. Usually i'm almost the last to comment..hehe! wow, thanks marzie for taking the efforts to dig up all the pictures, posts and links to us. Woah rockin' NAFA? Hehe! Thanks for the mention. Just a little something from us. So happy that u loved it! How can we not feature u who have been such a beautiful and friendly blogger? Thanks for ur b'day post again sweetie. I know it was already late and you stayed up to do it for me on the same day! Love ya lots! Wow Marzie! That's a lot of pressies!! Glad you birthday was a blast! 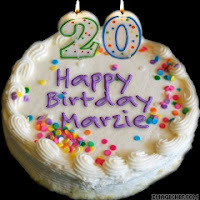 Thanks Marzie:) What a nice post! Marzie, muaccckkssss. So nice to see you back. How's your birthday celeb with B? Faster update us leh!! I cant wait for see the pic. I like Jamilla's coffee too, it's cute! And of course I like yours too, will put that one up at Mariuca's Perfume Gallery k! oh girl i didnt know!! im so sorry but here is my late wishes for a Happy birthday and may all ur wishes become true!! :)we will be here next year for more! You have been awarded yet again! Please come to http://projectheavytraffic.blogspot.com/2007/09/jumping-for-joy.html to collect your award. Cheers! Wow! Another award from my dear friend again?!! I can't wait to see it, thanks so much MT! You're da best! hehe..glad you like the poem. It was a lovely poem! oh, you were saying my poem was lovely ka, lj?